LAS VEGAS -- The Nvidia Tegra 4 was not a very well-kept secret, something that even Nvidia CEO Jen-Hsun Huang admitted. Project Wayne, as it was codenamed, was tagged for a first quarter 2013 launch way back in the first quarter of 2012. Well, now it's official?but we still know very little about this new system-on-chip platform for mobile devices. Conspicuously absent from Nvidia's splashy CES introduction was any information about release timing, products, and pricing. In fact, beyond showcasing a prototype Windows RT tablet running Tegra 4 and introducing Nvidia's ?Project Shield? handheld Android gaming device as the first Tegra 4-based product, we got precious few details about Nvidia's next-gen platform. The big news is that Tegra 4 now packs 72 NVIDIA GeForce GPU cores. That translates into six times the GPU power of Tegra 3, according to Nvidia, which should result in smoother, more realistic gaming, higher-resolution displays, and higher-resolution video playback. At Sunday's event, Nvidia demonstrated Project Shield outputting 4K ultra high-definition video to an HDTV. Tegra 4 is the first quad-core ARM Cortex-A15-based system-on-a-chip (SoC). Samsung's Exynos 5, found in the Google Nexus 10 tablet, is also based on ARM's Cortex-A15, but that's only a dual-core processor. In a live demo of webpage loading performance, the Tegra 4 appeared to scream through loading 25 pages, accomplishing the task in about half the time that it took the Nexus 10. If actual, shipping Tegra 4 tablets can achieve this kind of Web surfing performance, it's a critical improvement for Nvidia and its Tegra platform. The current Tegra 3 SoC routinely performs poorly on various Web page load tests that we perform on tablets. Another boon for the Tegra 4 is improved battery performance: It consumes up to 45 percent less power than the Tegra 3 does. The platform still has a fifth ?hidden? low-power core that it switches to when running off battery in order to extend battery life, and it improves its display technology, now dubbed PRISM 2. Nvidia says smartphones can achieve up to 14 hours of battery life during high-definition video playback, but the company didn't specify battery performance for tablets. Improving the battery performance is critical, too, given that Intel's Atom system-on-a-chip has shown the ability to be competitive. Perhaps even more noteworthy than the expected performance boosts was Nvidia's news of a new computational photography engine. Given the mediocrity of current tablet cameras, this addition was a pleasant and welcomed surprise. The engine is designed to allow for an array of high-dynamic range (HDR) capture possibilities for still photos, action shots with subject tracking, and video. Thanks to those 72 graphics processor cores, the Tegra 4 can handle near-instant capture and processing of two photos simultaneously. Depending upon the shooting mode, the Tegra 4 will then combine the two images to achieve a better exposed image with greater detail than the image sensor could capture in a single exposure. More 4G LTE tablets ahead? 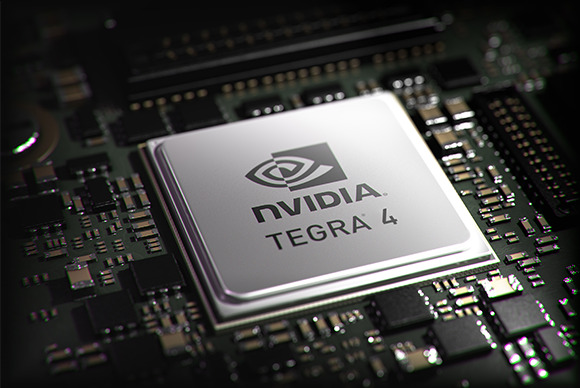 The Tegra 4 will be Nvidia's first chip to offer an optional built-in 4G LTE modem. The company's Icera i500 processor is a software-defined radio for delivering worldwide 4G LTE voice and data support. The chip is smaller and more efficient than conventional 4G modems, according to Nvidia, taking up just 40 percent of the conventional die area. Another advantage: Processor algorithms can be optimized and you can get over-the-air modem updates. With the 4G modem supplied as part of the Tegra 4 platform, this may help bring 4G-capable tablets coming to market more quickly, since manufacturers won't have to add the modem separately. While Nvidia announced Tegra 4, conspicuously absent was the presence of a launch partner. Or a launch date. Or any sense of what the pricing will be, and what production costs are vis-a-vis Tegra 3. Given the seemingly quiet tablet front here at CES, even as the show gets underway, it seems unlikely we'll hear anything about a launch tablet here, especially given that Nvidia already told us that its Project Shield will be the first Tegra 4 device, and that won't be coming out for the next few months. Place your bets for more news to come by the end of February, at Mobile World Congress in Barcelona. That's when Nvidia has its next big news announcement coming.